In a derelict and nondescript warehouse off 16th and South Van Ness, Hit Gallery occasionally announces itself by propping open a heavy metal door. From there, a foyer leads to stairs and the main gallery, run by artists Marissa Leitman, Peter Hurley, Brittany Newell and Silk Worm since February of this year. 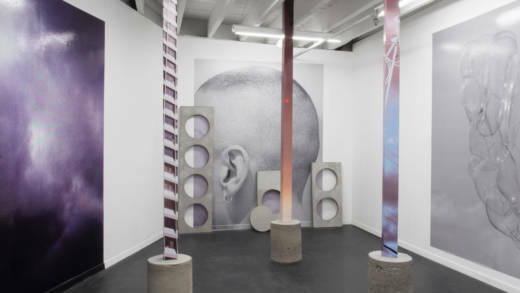 If you happen to catch the gallery on a propped-door day (or make an appointment to visit), you'll currently step into Performance Anxiety, a collaborative show by Ryan Molnar and Jack Bool, San Francisco and Oakland-based artists, respectively, working in photography and installation. Through an interdisciplinary approach, the duo examine the stratification of our online and offline identities, and the mechanisms by which our cyber and material environments distinguish a sense of place. Their work probes the boundaries and grievances of digitality, a term derived from Nicholas Negroponte’s 1995 book Being Digital. It is the condition of living (partially or mostly) in a world that’s navigated on screen. In digitality, while our sense of self remains informed by our material and tangible surroundings, it’s also shaped by ephemeral qualities—fleeting images, impalpable relationships and an onslaught of universally available information. 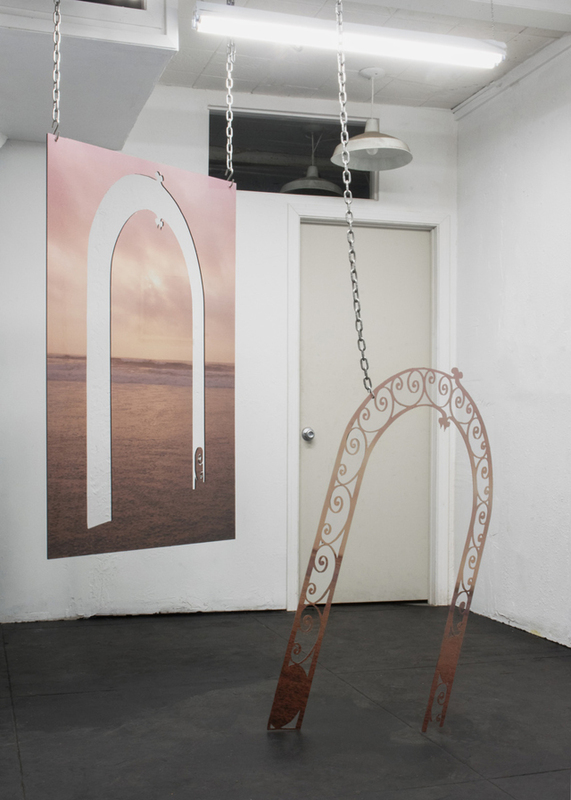 The first image encountered in Performance Anxiety is Bool’s Sun at 50 Percent Opacity, a sunset printed on perforated vinyl adhered to acrylic, the center of which has been punctured by the laser-cut shape of a wrought-iron security grill—the decorative barriers placed over ground-level windows. The pastels of the sunset (the most democratic form of beauty) juxtapose against the weaponization of our architectural surroundings. Like the rock gardens under freeways that keep unhoused communities from sleeping there, this object references the resounding ethos of the Bay’s current demography—the notion that only those who can afford this place have the right to be here. Adjacent to this piece is Molnar’s Sunburn—another sunset image, this one veiled by a grid of burn marks incised with a magnifying glass. Hauntingly, perhaps fittingly, Performance Anxiety opened on Nov. 16, a day when San Francisco’s air-quality index placed it among the most polluted cities in the world; gallery attendees arrived in face masks. The timing created a shared resonance between the truncated beauty of the artists’ sunsets and the heightened sense of our real-life environmental degradation. The combined imagery of natural catastrophe and gentrification summon the anxiety of living in the muck of digitality. Meanwhile, the materials in Performance Anxiety (vinyl, metal, concrete) address the sinister underbelly of San Francisco’s stunning landscape. The forces that drive the redevelopment of San Francisco come from the demands of the newly anointed tech workforce, and the process of appeasing these demands informs the aesthetic of our surroundings. Centered on the main floor of the gallery sit three 6-by-6-inch beams, each wrapped in pigment-printed vinyl. The windowed facade of a high rise, a misshapen telephone line, and a red sun succinctly evoke San Francisco. And although each beam is structurally sound in its cylindrical concrete base, they bear no weight. Additional vinyl images adhere to the walls like they would street level scaffolding. Pierced slabs of concrete lean against the vinyl like refuse. Molnar and Bool's photographs are slow, gentle and swell with light—the installation likens the physical process of moving through San Francisco with the experience of scrolling through an endless feed of images. In doing so, the artists mirror the placelessness of our digital space with San Francisco’s cyclical plight of reinvention. On a vertically upright monitor plays A Screen That Makes You Forget Your Body, a video piece by Molnar showing iPhone footage of golden-hued clouds from a plane, city lights and horizontal rain on car windows in rapid succession. These everyday melancholy images make time’s relentless passage tangible. Instead of remembering things, we take pictures of them. The internet and social media give us the privilege and daunting task of organizing our histories in real time. In their day jobs, both Bool and Molnar work in commercial and editorial photography; they’re part of an ever-growing faction of photographers who receive commissions for commercial work through Instagram. Although the artists draw a distinction between their artwork and commercial work, their respective web presences impact their practices on and off screen. “I find art photography suffers from being seen on a six-inch screen,” Molnar says in an email. “This is the nature of the smartphone as a medium for the dissemination of images.” His desire to create photography in a more physical way—and have it be experienced in person—is in direct response to what he calls “the immaterial nature of the internet.” While creating the work for Performance Anxiety, Molnar deactivated his Instagram account in an attempt to ground himself in the present, to fully digest the here and now without the pressure of being seen. Performance Anxiety straddles a relationship between the real (composed of matter) and the seen (of pixels). Digitality causes an anxiety that takes a concrete form: mindless scrolling, forgetting the citations for our own interest, and the supplementation of friendships with app-bound DMs. Molnar and Bool are not perpetuating these conditions, but rather staging a material intervention for us to consider its palpable presence in our lives. ‘Performance Anxiety’ is on view at Hit Gallery (2740 16th Street, San Francisco) through Dec. 19, 2018. Gallery hours by appointment. Details here.